One of the great pleasures of traveling is meeting cool, interesting people along the way. Sometimes they can give you glimpses into ways of life that you never imagined. Whenever that happens, I feel like my world got a little bit larger. I’ve added one more perspective that I didn’t have before. 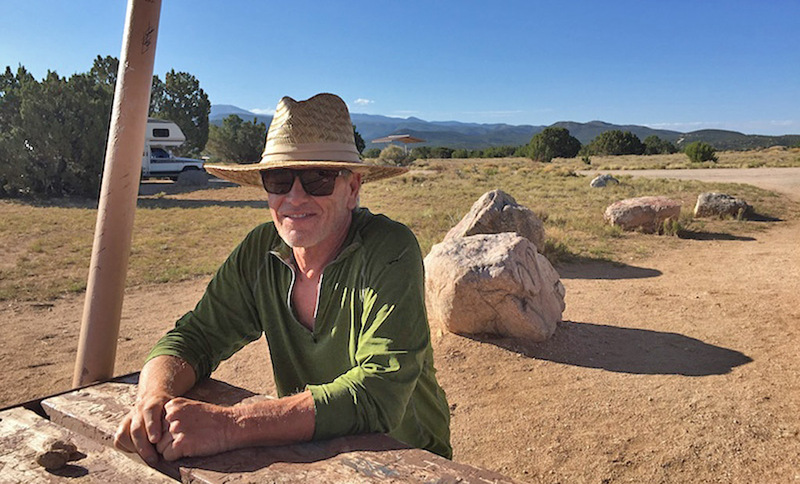 Tom was camped out next to me in northern New Mexico, at the Santa Cruz Lake Overlook campground. As often happens, we got to talking. We talked about this place, other places nearby, where we were coming from and going to, and a whole lot more. It turns out that we’d been to many of the same places, but we had different experiences there. I went to Quartzite for a Toyota RV rally. He went to Quartzite to find gold. I went to Alaska to see glaciers and wildlife. He went to Alaska to find gold. I went to California for sailing, backpacking, etc. He went to California to find gold. I went to the Yukon for scenery and history. He went to the Yukon to find gold. I went to Baja for beaches and whale watching. He went to Baja to find gold. Listening to his stories, it sounded like it’s super simple to find gold. 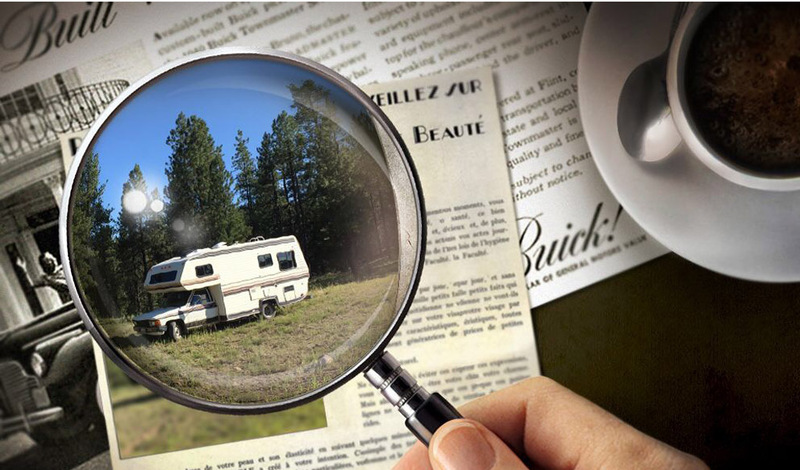 Depending on where he was, and when he was there, he’d tell of finding an ounce a week or three ounces in a weekend, out there working an area with his metal detector. 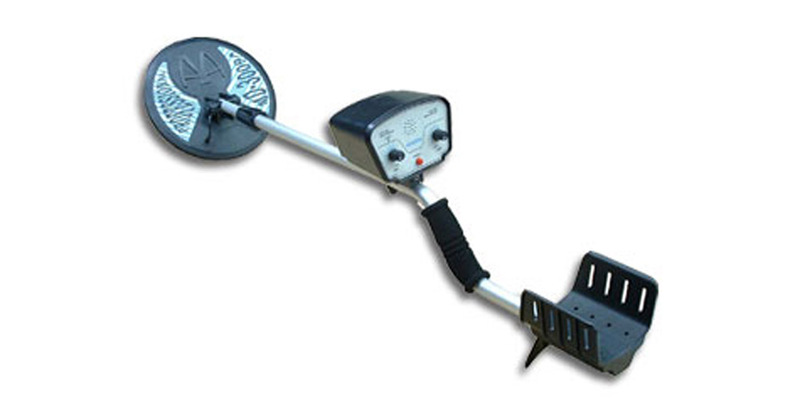 Just grab that metal detector and go get some gold! I’ve never known anybody to say in casual conversation “Well, I may run over to California next month, and pick up some gold.” And the thing is he means it. He really will go over to California, and he really will pick up some gold. My personal experience is limited to a couple of backbreaking hours gold panning in a Yukon creek, which turned up absolutely nothing. But now I know somebody who proves that it’s possible to make this pay! Tom admitted it’s not as easy as it was 20 or 30 years ago, because areas are more picked over than they used to be. But he still has great confidence in his ability to find gold. It’s all in knowing where to look, and he’s got years of experience with that. Like the time when he was one of the earliest prospectors out in the wilderness of Alaska’s Brooks Range. Talk about isolation! The weekly plane flying overhead was his only reminder of outer civilization. Or the time he was abandoned in the desert with no food or water, and had to hike 30 miles cross country, through canyons and cacti, at night, to reach some water to save himself. Then there was the time he and his companions had to sneak out of their camp and flee in the darkness, to avoid Mexican bandidos who knew about their gold, and threatened to kill them and take everything. I’d wonder if this guy was just playing me with made up stories, but he had enough solid details in there of the places we’ve both gone, that I’m convinced he’s for real. And a treasure hunter too? Call me naive, but I thought that gold hunting was the same as treasure hunting. I stand corrected! Looking for gold is more of a sure thing. If you’ve done it enough, you know where to look, and you just get to work. The gold will turn up. On the other hand, treasure hunting is much more difficult. You have to follow massive numbers of clues, and you’re never really sure if you’re on the right track until you get to the end. Have you heard of the hidden treasure of Forrest Fenn? This was all news to me, but it’s quite a tale. Forrest Fenn is a well-known name in Santa Fe, New Mexico. He was the founder of the prominent gallery and sculpture garden which is now owned by Nedra Matteucci. His life story is like a typical businessman who made good. Apparently this guy hid an elaborately decorated metal chest full of rare coins, gold nuggets, gemstones, and jewelry. 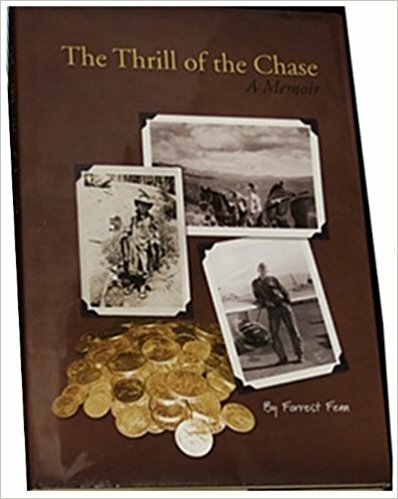 In 2010, Fenn published a book called “The Thrill of the Chase“. 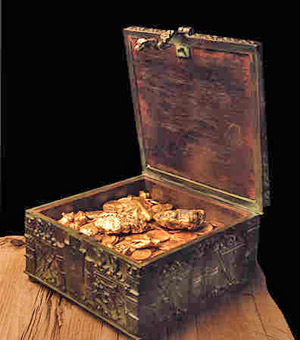 In the book, he said that he had hidden this treasure worth over a million dollars, somewhere in the Rocky Mountains. The book provided clues for how to find the treasure, including a poem that’s supposed to be the key. Aside from the poem, everything else in the book could be a clue, too. The way somebody is holding their arms in a picture, or a word that is misspelled, or a hole that appears in one photo but not in another. There are online forums such as dalneitzel.com, where dedicated treasure hunters can discuss questions like what he meant by “home of Brown“. The poem and other clues can be interpreted in many different ways, which makes the chase a challenge. By now, there are tens of thousands of people searching for this fortune in a box. People take this stuff seriously! In fact, a couple of people have even died in their search for the treasure. After spending years as a Forrest Fenn treasure hunter, Tom said he’s got it mostly figured out. He thinks that there’s probably just one more piece of the puzzle that he’s missing, and as soon as that falls into place he’ll find the treasure. He also said that he now sees clues everywhere. In fact, he even wondered if I was a clue! Personally, I don’t see how I fit into the story at all, but he said it could be as simple as something I said, or a question I asked, that gave him a slightly different thought to pursue. I guess it’s like me with Toyota motorhomes. I never even knew what they were until I got Zennie, but now I see Toyota campers everywhere I go. I can’t avoid the skeptical side of my brain, that wonders if the whole thing was set up as a hoax by Forrest Fenn. After all, no matter how rich you are, why would somebody take a million-dollar treasure and hide it out somewhere in the mountains? Perhaps there really is no treasure. He might have done it as a lark to start with, just a way to get some publicity, sell some books, and have some fun. Then as thousands of people started taking it seriously, he didn’t want to admit that there really is no treasure. I asked Tom about this, and he’s convinced (obviously!) that the treasure is real. He said part of Fenn’s motivation was to get people outdoors, enjoying nature, instead of sitting inside with their video games. In that novel world of treasure seeking, you can do a lot of research online, but you’ve got to get out there on the ground to really look. The next question is, how do you know somebody else hasn’t already found it? 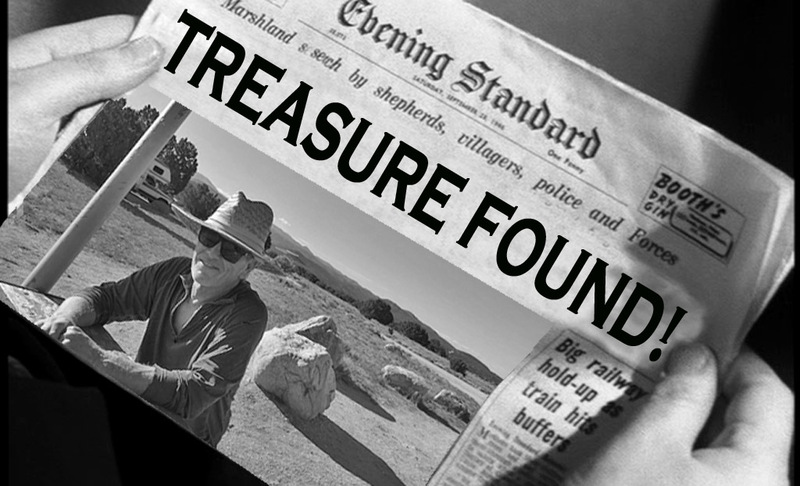 Tom’s answer is that this will be big news around the world when someone uncovers the treasure. The publicity they can get, and the money from selling their story, could be worth more than the treasure itself, so there’s no reason for somebody to keep it quiet. And even if they wanted to, it might not be possible. After a day and a half hanging out with Tom, I continued on my merry way, abandoning thoughts of worldly treasures, and searching instead for beautiful hikes, fascinating places, and peaceful campsites where the stars shine bright. Tom continued on his treasure hunt, and I wish him all the luck in the world. One of these days, I hope to read on the front page of some newspaper about a treasure hunter named Tom, who just struck it rich. Have you ever found gold? How about a treasure? In my mind, travel is full of treasures — just not the monetary kind! 🙂 I’d love to hear what you think in the Reply section below. Sounds like you’ve found your treasure already! ???? Hope Tom does as well!